The much anticipated Houston International Quilt Festival has come and gone. It is always amazing and overwhelming at the same time. 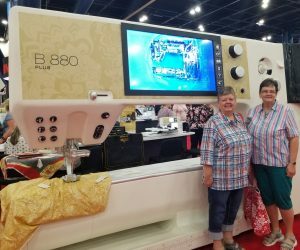 My friend Jody and I had to take a picture by the huge sewing machine. We thought about sending it to our husbands and telling them it was the new sewing machine we just bought. There are so many quilts and so many vendors that there’s no way to see everything without staying the whole time. But my t-shirt quilts are calling my name, so I had to get home and get busy. I’m still taking Christmas orders for a couple more weeks and then I’ll have to cut it off. However, I do sell gift certificates if you would like to give a quilt for Christmas and can’t get the t-shirts to me in time.